Early childhood education is important, and at First Class Child Development, we’re here to provide the best care for your children. You probably know all too well that your child’s attention span is increasing, and that’s why the team at First Class Child Development is here to help foster your toddler’s learning. 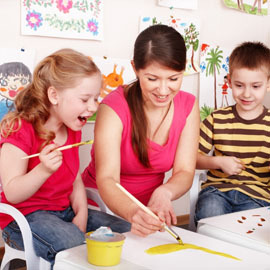 We utilize dramatic play, blocks, art, and toys to allow your child to develop his or her own interests. We know that you want the best level of care for your toddler, and you can count on our team to provide it. Please label all personal items with your child’s name. This environment is designed for the toddler who is speaking in simple sentences and capable of following simple direction. This age group begins drinking from a cup and exhibiting interest in toileting. 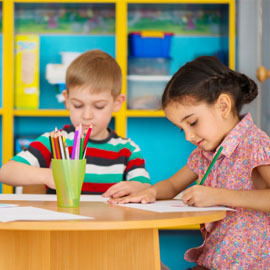 Since the attention span of older toddlers is increasing, learning centers, such as dramatic play, blocks, art, library and table toys are introduced and children are free to choose their own areas of interest. When the child and family are ready for toilet training, we work with consistent positive encouragement. Children are never scolded or shamed about toileting in their pants. 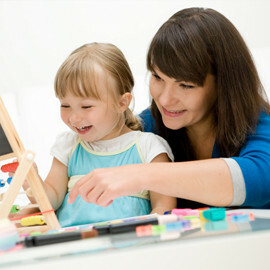 In all areas, children are praised for their accomplishments and helped to feel competent and in control of themselves. Children of this age constantly test limits and express opposition to adults (“No”) as part of developing a healthy sense of self. Supplies you need to bring: diapers, pull-ups, extra clothes, toothbrush and toothpaste, and nap time lovey that will help your child feel comfortable. Please label all personal items with your child’s name. Contact us today to find out how you can enroll your toddler at First Class Child Development.